The significance of Great Zimbabwe and how to use these monuments to the best advantage of his new territories occupied Rhodes’s mind. It seems he called on some of his London contacts and staff to work on the matter for him over a period of a few weeks and the result was, for Theodore Bent, decisive. The activity culminated in a meeting of the Royal Geographical Society (RGS) in London on 24 November 1890. It was a meeting to which Bent had come briefed and within a few months he and Mabel were away trekking in South Africa, minor characters in Rhodes’s grand schemes for his nascent country. 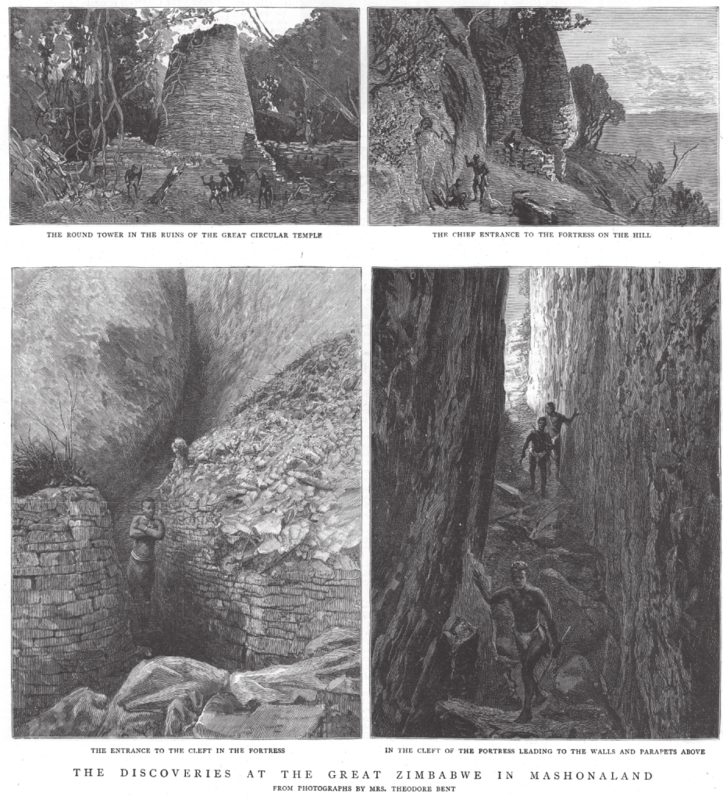 A short summary explores the background to Theodore’s recruitment for the challenge of exploring Great Zimbabwe, and an outcome that, to this day, has him central to a long-running controversy over the site: even to the extent that his name appears in archaeology textbooks that include chapters on ‘racism’. Mabel’s previous 1885 Chronicle, after detailing the couple’s brief interlude in Cairo, goes on to find the explorers continuing their work in the Eastern Mediterranean – the focus of Theodore’s interests until 1889. During this period he was a ceaseless lecturer and writer of popular and academic articles, as well as a busy Committee member for the Anthropological and Geographical Sections of the British Association for the Advancement of Science. By 1889 the type of unlicensed and unscientific excavations specialized in by Theodore were becoming less welcomed by the authorities of both Greece and Turkey, and it was more prudent for him, in the short term at least, to explore elsewhere. The explorers sought a new focus for their research: preferably a British-controlled focus. In the winter of 1878, the British Captain E. L. Durand had undertaken tentative explorations among the extensive ’Ali grave mounds on the small island of Bahrain in the Persian Gulf and the British Museum offered a grant towards the costs of further surveys on the island. 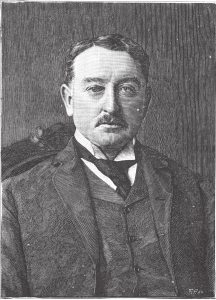 Theodore, no doubt having read Durand’s work (1880) was curious about various long-standing theories and Classical references that seemed to link Bahrain with the Phoenicians, and in turn to the movement of early peoples around the eastern Mediterranean (an interest of Theodore’s that was soon to become an overriding one). Geopolitical factors were by then more favourable east of Suez: the great canal was open, and Aden, the brilliant choice as the British key to the southern Red Sea, was developing apace. Accordingly, by February 1899, Theodore found himself digging in Bahrain. His finds were modest, but illustrative. Bearing in mind all the efforts of getting there (via India), the couple in fact only spent fourteen days on the island – it very soon occurred to Theodore that he was wasting his season with uninteresting finds. By the end of February the couple leave again for Bushire across the Persian Gulf, Mabel adding in her diary: ‘[Having] passed 40 days and 40 nights of our precious time on the sea, we then and there made up our minds to return over land…’ With this throwaway remark, Mabel announces an epic ride towards home of some 2000 kilometres through Iran. Few would take it on today. On his return to London in June 1899, the research Theodore undertook into Persian history, and the two weeks spent digging among the ‘Phœnicians’ in Bahrain, seem to have been sufficient to land him the plum job as first official surveyor/excavator of Rhodes’s zimbabwe ruins in 1891. He was keen to do it – at the beginning of 1890 there was no real focus to his work as a freelance explorer and his career (and future funding) necessitated discoveries, momentum, and publications. Back from Bahrain and Persia, and before any prospect of central Africa, Theodore was immediately working hard, writing up his results, breaking off for family visits to Ireland and the north of England (especially Sutton Hall, near Macclesfield). After that it was time to think of his 1890 campaign. Cecil Smith of the Department of Greek and Roman Antiquities at the British Museum suggested to Theodore that he might find it worthwhile to excavate around the Black Sea coastal town of Bourgas (Bulgaria). He would need authorization, and Smith recommended that he should contact George Herbert, the 5th Earl of Carnarvon, who might both be able to effect an introduction and assist financially. Theodore visited the Earl at Highclere (aka ‘Downton Abbey’, of course) in October 1889 but the political situation in Bulgaria and the sensitivity to freelance excavations made such an expedition ultimately unattractive to the explorer. Rhodes and Carnarvon’s father were close and indications of Theodore’s need for a ‘project’ may well first have come to Rhodes’s attention via Highclere. The Bents had returned to London by early May 1890 from a final survey of the Turkish littoral, with relatively little to present in the way of finds. However thanks to his lectures, association memberships, and, by now, scores of published papers, magazine articles and newspaper editorial reports (he was a committed self-publicist), Theodore was by now an established ‘expert’ and regular at the Royal Geographical Society (RGS), which had become, naturally enough, the focus for his activities and contacts. For the last few seasons that Society had awarded him grants towards his expeditionary costs. In November 1889 Theodore had presented a paper on his ‘Phœnician’ Bahrain finds, and the months previously were spent researching into what was then understood about this early and highly mobile and influential population of traders and settlers. The (later) activities of the Persian dynasties would also have provided reading material for Bent at this time. This research was put to one side while the couple returned to Turkey in early 1890, but it resurfaced that winter following reports by Rhodes’s Pioneers after visiting Mauch’s stone-built ruins near Fort Victoria. As he was delivering the opinion ‘until they are thoroughly dug out and investigated’, Theodore might have caught Maund’s eye. It is hard to believe otherwise than that he had already been hired, or was very close to being so, by Rhodes and that he and Mabel would need to prepare immediately for South Africa. 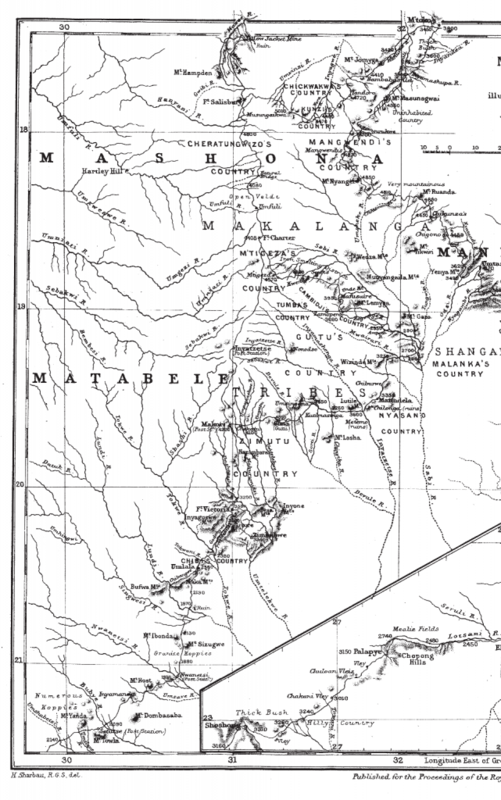 A section of Theodore’s map in southern Africa (photo: The Bent Archive). The Bents’ journey included (after steamer to Cape Town): train to Kimberly, ox-cart and horses to Fort Victoria, ‘Great Zimbabwe’ and its vicinity, Fort Salisbury and its vicinity, Umtali, the Pungwe River, Beira (Mozambique), and from there the regular steamers sailing south and round to Cape Town once more (before the long voyage home to London, via Lisbon). With astonishing rapidity by all concerned the first edition appeared in November 1892, having been written, printed and lavishly bound in barely nine months. Disseminating Theodore’s genuinely held, but unsubstantiated theories, the book was soon sold out. A new (and cheaper) edition was prepared for August 1893, with subsequent reprints in both January 1895 and 1896, and a final edition in March 1902. The appearance of Randall-MacIver’s volume in 1906, with his opinions on the ‘modern’ nature of the material, undermined future sales of Theodore’s volume but it is readily available today in a variety of formats. The original Prefaces of the editions of the 1890s are valuable in that they were augmented by Theodore, quick to refer to fresh evidence that seemed to back his findings. The Ruined Cities of Mashonaland remains a fair read. Although not Bent’s best (The Cyclades and Aksum take precedence), its adventurousness, topicality, and large number of illustrations and photographs made it one of the books of the year.